Critical Theory and the Critique of Political Economy. On Subversion and Negative Reason. London: Bloomsbury, 2014.
with Beverley Best and Chris O’Kane, The SAGE Handbook of Frankfurt School Critical Theory (London: Sage, 2018). with Kosmas Psychopedis, Human Dignity. 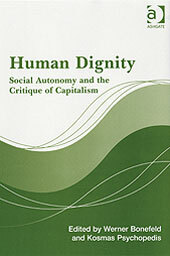 Social Autonomy and the Critique of Capitalism. Aldershot, Burlington: Ashgate, 2005.
with Beverley Best and Chris O’Kane, ‘Introduction: Key Texts and Contributions to a Critical Theory of Society,‘ in Beverley Best, Werner Bonefeld and Chris O’Kane, eds. The SAGE Handbook of Frankfurt School Critical Theory (London: Sage, 2018), vol. 1, 1–15. with Beverley Best and Chris O’Kane, ‘Introduction: Key Themes in Context of the Twentieth Century,’ in Beverley Best, Werner Bonefeld and Chris O’Kane, eds. The SAGE Handbook of Frankfurt School Critical Theory (London: Sage, 2018), vol. 2, 581–586. with Beverley Best and Chris O’Kane, ‘Introduction: Contexts of Critical Theory,’ in Beverley Best, Werner Bonefeld and Chris O’Kane, eds. The SAGE Handbook of Frankfurt School Critical Theory (London: Sage, 2018), vol. 3, 1134–1141. ‘Authoritarian Liberalism, Class and Rackets,’ in Logos 16, 1–2 (2017). ‘Negative Dialectics and Critique of Economic Objectivity,’ in History of the Human Sciences 29, 2 (2016), 60–76. ‘Antisemitism and the Power of Abstraction: From Political Economy to Critical Theory,’ in Marcel Stoetzler, ed. Antisemitism and the Constitution of Sociology. Lincoln, NE and London: University of Nebraska Press, 2014, 314-332. ‘Adam Smith and Ordoliberalism: On the Political Form of Market Liberty,’ in Review of International Studies 39, 2 (2013), 233-250. ‘Negative Dialectics in Miserable Times,’ in Journal of Classical Sociology 12, 1 (2012), 122-134. ‘Praxis und Kritik: Bemerkugen zu Adorno,’ in idem and Michael Heinrich, eds. Kapital and Kritik. Nach der »neuen« Marx-Lektüre. Hamburg: VSA, 2011, 328-352. ‘Abstract Labour: Against its Nature and on its Time,’ in Capital & Class 34, 2 (2010), 257-276. ‘Nationalism and Antisemitism in Anti-Globalisation Perspective,’ in idem and Kosmas Psychopedis, Human Dignity. Social Autonomy and the Critique of Capitalism. Aldershot, Burlington: Ashgate, 2005, 147-171. ‘Anti-Gobalisation versus Anti-Capitalism: The Dangers of Nationalism, Racism and Anti-Semitism,’ in Pratyush Chandra, Antrada Ghosh and Ravi Kumar, eds. The Politics of Imperialism and Counterstrategies. Delhi: Aakar Books, 2004, 302-329. ‘La anti-globalizacion significa autodeterminacion: el peligro del nacionalismo y del antisemtismo,’ in Herramienta no. 23 (2003), 85-105; revised Korean version in idem, Capital, and Class: On Negation and Subversive Reason. Seoul: Galmuri, 2011, 339-353; revised Spanish translation in idem, La Razon Corrosiva. Buenos Aires: Herramienta, 2013, 261-286. ‘Notes on Anti-Semitism,’ in Common Sense no. 21 (1997), 60-76.